Adam, I read and enjoyed David Sobek's article on biotech stock bubble but was wondering if you had an opinion, one way or the other? Yes, we're in the midst of a biotech stock bubble. He's right. Biogen Idec's ( BIIB Tecfidera, Gilead Sciences' ( GILD hepatitis C drugs, Regeneron Pharma's ( REGN Eylea, Pharmacyclics' ( PCYC ibrutinib, the booming orphan drug launches led by Aegerion Pharma ( AEGR, NPS Pharma ( NPSP and others. The biotech sector is developing more and better drugs than ever before, and as a result the fundamentals underlying the sector are stronger than ever. This is an undeniable fact and investors are acting accordingly, justifiably so. None of this means that some biotech stocks aren't overvalued. Sobek is right to differentiate between valuations that are stretched too far for select biotech stocks that are otherwise fundamentally strong and a true, irrational stock bubble. As he points out, strategic buyers of biotech assets -- Big Pharma -- seem to be recoiling at high prices. It's an important signal to watch for a possible correction. Biotech sentiment is awesome. It's unbelievable right now. It's unlike, honestly, anything I've seen in my 13 years. I started in 2000 so I do remember the 2000 genomics bubble but that felt to me... more like a market issue or market call as much as a biotech call. Right now, it feels different. It feels like people are making a very specific biotech call. 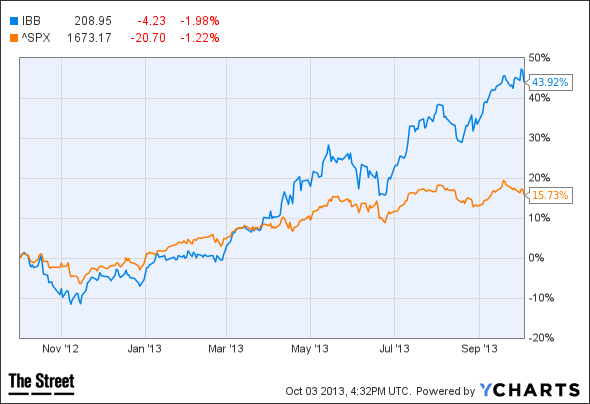 Where is the biotech stock bubble strongest? In the small-cap stocks, particularly among the stocks I affectionally refer to as the "bio-crud." These are the companies I'm often accused of "bashing" -- Northwest Biotherapeutics ( NWBO, Galena Biopharma ( GALE, Osiris Therapeutics ( OSIR, Oncolytics Biotech ( ONCY, to name a few. They're also the stocks in which retail investor interest is the highest, unfortunately. Institutional investors aren't touching these fundamentally weak stocks, but yet they also still move higher on crazy speculative buying, rumor-mongering and the greater fool theory. There are plenty of biotech bubbles amongst the small-cap "bio-crud." And when these bubbles burst (and most inevitably do), the carnage isn't pretty. Lastly, keep a wary eye on the increasingly preposterous excuses sell-side analysts are coming up with to justify higher and higher stock valuations. I red-flagged a particularly egregious example this week in Celldex Therapeutics ( CLDX - Get Report). I realize analysts have little choice but to cheerlead stocks higher, but their behavior only fuels bubble behavior. Being that you're the only logical person that understands Cel-Sci (CVM, can you please shed some light on its recent stock split. I'm amazed how this company continues to devalue and dilute without ever producing one piece of data showing progress with Multikine. Cel-Sci is in desperate financial shape. The 1-for-10 reverse stock split is intended to keep the company solvent so its top executives can continue to receive their lavish and undeserved compensation. The Multikine phase III study in head and neck cancer is a train wreck with little hope of being completed. As of April, only 117 patients were enrolled. The study is supposed to enroll 880 patients. Cel-Sci began this study in December 2010, which means the company is enrolling 4.2 patients per month. At this rate, Cel-Sci will complete enrollment of the Multikine study in 2028. Let's assume Cel-Sci figures out a way to triple the rate of patients entering the study. If it can do that, the study will still take another five years to reach 880 patients. Cel-Sci closed the second quarter with $3.5 million in cash, enough to remain operational through December. The company hasn't raised any new cash this year despite an incredibly hospitable environment for bio-pharma finance. 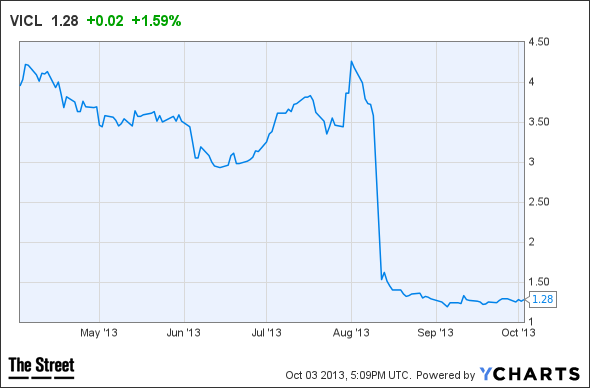 Investors are throwing money at biotech and drug companies, but apparently not at Cel-Sci. To pay for the rest of the Multikine study, Cel-Sci must raise $37 million. At $1.49 per share (Cel-Sci's closing stock price Wednesday, after the reverse stock split took effect), the company would need to issue another 25 million shares to raise $37 million. With 46 million fully diluted shares, options and warrants already outstanding, Cel-Sci would have to dilute existing shareholders by 54% just to raise enough money to complete the Multikine study. This calculation doesn't even take into account the cash needed to pay the company's everyday expenses, which, by the way, includes paying Chairman and President Max de Clara $166,000 per year in interest payments on a $1.1 million loan he made to the company in 2009. Yes, that's right, Cel-Sci's own chairman is the sole creditor on a loan to the company that bears an interest rate of 15% and is secured by all of the company's assets. What a guy. Did I mention Cel-Sci also pays de Clara $363,000 in annual salary, plus options and other perks? Cel-Sci CEO Geert Kersten takes home $477,000 in annual salary. His total compensation package last year was worth $882,000. Back to the rationale for the reverse stock split. Without it, Cel-Sci would be delisted and end up on the bulletin boards, which would all but guarantee the company's bankruptcy. With the reverse stock split, the company has a fighting chance to raise more money. Vulture funds are more likely to give Cel-Sci money -- at usurious terms, of course -- with a balance sheet that appears healthier, at least superficially. Cel-Sci executives know Multikine is a zero but any money raised provides them with prolonged job security -- and extravagant pay checks -- for the foreseeable future. The point I made Wednesday -- and correctly, I still believe -- is that investors reacted irrationally to the announcements from both Delcath Systems ( DCTH and Zalicus ( ZLCS that their respective drugs had been granted orphan drug designation by the FDA. Investors were buying Delcath and Zalicus as if FDA was endorsing their pipeline products, but that's not true. The agency grants orphan drug designation based on disease prevalence, not whether or not a drug is likely to be effective. We'll know more about the activity of Zalicus' Z160 pain drug when the company announces results from two phase II studies in the fourth quarter. Z160 is an oral, selective N-type calcium channel blocker with a checkered past. It was once licensed to Merck but was abandoned due to poor trial results. Zalicus regained control and reformulated Z160 to improve its bioavailability -- and hopefully make the drug more potent. Meantime, the company was forced to push through a 1-for-6 stock split on Thursday to keep the stock price above $1 and avoid delisting. Institutional ownership of Zalicus is 8.5% -- very low relative to the 86% retail investor holdings, according to CapitalIQ. Maybe Zalicus is an overlooked, mis-interpreted small-cap drug stock shunned erroneously by Wall Street investors. That's entirely possible. But it's equally possible that Wall Street has kicked the tires on Z160 already and found the drug lacking. I'll remain agnostic on this question until we see the data that Z160 can deliver. Moving on to the next "Z" stock, Zogenix ( ZGNX provided an update Tuesday night on the FDA review of Zohydro, an extended-release formulation of hydrocodone that doesn't contain acetaminophen. Zogenix and the FDA have completed the final labeling and reached agreement on the post-marketing requirements for Zohydro ER. The FDA has also reconfirmed there are no deficiencies in the NDA. While the FDA indicated its intent to take prompt action on the Zohydro ER NDA, the timing for a decision may be impacted by the current government shutdown. The FDA indicated earlier today that agency activities funded by PDUFA user-fees remain operational. If approved, Zohydro ER will be classified as a Drug Enforcement Agency (DEA) Schedule II drug, making it subject to strict prescribing and dispensing rules, compared to the hydrocodone-acetaminophen combination products, which are classified as Schedule III controlled substances. Sounds very much like FDA is leaning towards approving Zogenix, I must admit, which is confusing to me given the agency's crackdown on opioid abuse. Zohydro is not abuse deterrent. I am (was) in the camp predicting an FDA rejection of Zohydro. You might be right. Kudos if you are. In my defense, it does sound like an FDA approval of Zohydro , if it happens, will come saddled with significant restrictions. Making Zohydro a Schedule II drug is going to be a big problem for Zogenix from a commercial standpoint. 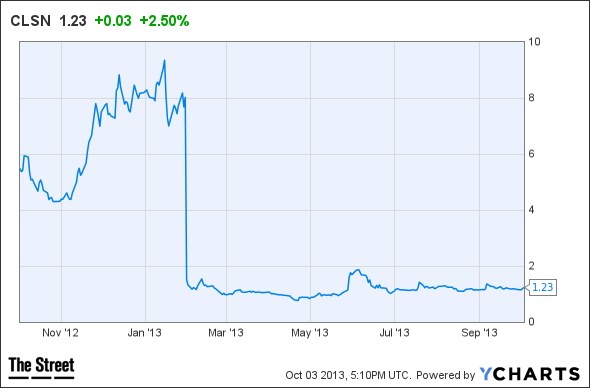 Isn't it time you laid off the bashing of Arena Pharmaceuticals (ARNA - Get Report)? At $5, the stock seems like a bargain to me. It's up from here. Larry makes the classic mistake of equating stock price with valuation. At $5 per share, Arena market value is still $1 billion. With Belviq sales estimates still falling due to the poor launch, Arena is still not cheap. Sorry. Me, positive on biotech stocks? Crazy! You're welcome.